It’s with a mix of excitement and bummed-out-dom that I approach the last race of the 2010 IndyCar schedule, to take place in Homestead this weekend. It’s exciting to see who’s going to be the champ, but it’s tough to realize that after this, we have a long winter of no on-track IndyCar action. And verily, that sucketh mightily. There are a number of battles to watch, but of course the main battle is upfront, with Will Power and Dario Franchitti competing to see who will come away with the overall championship. If you’re interested the particular scenarios for who needs to do what to walk away with the championship, see the pdf here. My gut feeling? Power’s a better story, but I just don’t think he has anything for Dario on this oval. Dario will drive smart, be up front, and will be in a position to bring it home. Power could finish anywhere from 2nd to 10th, and it wouldn’t surprise me. -Simona’s Not Done Yet: The always-dependable Pressdog reports that HVM Racing and Simona de Silvestro will be on track this weekend. There was some worry over HVM folding last week, but apparently, they’re going to compete this weekend. Had she been unable to move forward, that would have killed what was an interesting battle for Rookie of the Year between her and Alex Lloyd. -Which Rookie Comes Out On Top? Just because Simona will race at Homestead doesn’t mean she’ll have an easy time nabbing Rookie of the Year honors. Her is tub is old and slow, and she’s not shown blazing speed on the ovals anyway this year. Alex Lloyd hasn’t been knocking them dead lately, but barring some awesome strategy or extreme twists of fate, he should back into finishing the year as the top rookie in points. -Sarah All Done? There have been rumors this will be Sarah Fisher’s last race, that she’s retiring as a driver after Homestead. I’m not sure I buy it, but I do know she wants to start a family sometime in the future. Whether or not the future is now, I don’t know. She’d be missed, from a fan’s point of view, but I have to think she’d be highly visible in any sort of owner position, for sponsor reasons. -Musical Chairs: This weekend will see Ana Beatriz taking over the #24 car for Dreyer & Reinbold Racing, and Sebastian Saavedra will be in the #36 car. Saavedra didn’t make a lot of friends from the odd timing of his bailing out of his Indy Lights ride hours before a race, but there he is. He’s got the potential now to be a new villain, only a few months after his improbable qualification for the Indy 500 made him a good-news story (unless you were Jay Howard or Paul Tracy). -Last Chance To Make A Statement: We can anticipate the usual dance of musical chairs for rides in the offseason, so this is one last chance for drivers who might be looking for a new seat next year to make a statement. Keep an eye on Dan Wheldon especially, who’s been driving the wheels off his car for the last month. -Homework Question: Who qualifies better—Milka Duno, or Simona de Silvestro in her dilapidated tub? -Dark Horse: Barring an accident, I don’t see anyone else being a huge factor in this race, but let’s not discount Panther Racing. Ed Carpenter, Dan Wheldon, and their team pretty clearly have this oval business figured out. But at this point, can they really be considered a dark horse? If not, please see Rahal, Graham. Graham qualified 6th here last year, and finished 11th. Fellow Newman-Haas driver Hideki Mutoh also had a 6th-place finish at Homestead in 2010, so the two teammates for this race should not be discounted. -Pole Position: Dario. He won’t be denied, and I don’t think Power’s savvy enough on ovals to get it done. -Laps Led: Dario. See above. -Bye-Bye Homestead: This might be the last event at Homestead for the IZOD IndyCar Series for a bit, depending on how things go in the future with ISC. One things' for sure, and that's that the series won't be at Homestead in 2011. I'm curious to see the crowd for this last race--I'm not expecting great things, though. Hey! As a last, important, note, if you’re reading this and have yet to follow Ryan Hunter-Reay on Twitter, please do so. When RHR gets to 10,000 followers, a $10,000 donation will be made to Racing For Cancer. RHR’s close, and I know we can get this done. If you’re interested in donating further to Racing For Cancer, be sure to check out the special event Inside The Race is having this weekend! IMS Fan Appreciation Day Recap: Scheck, Pippa, Donald, and More! I loaded up my oldest daughter (six years old, going on eighteen) yesterday and headed down to the Indianapolis Motor Speedway for Fan Appreciation Day. -Steve Chassey, Paul Goldsmith, Eldon Rasmussen, and Bob Harkey were all on hand as Indy 500 Legends. I ended up with all their autographs on a single page, which is going to hang in some prime real estate in my corner of the dwelling. -Indy Lights drivers Pippa Mann and Philip Major from Sam Schmidt Motorsports were both on hand, also signing autographs. Pippa was especially nice to my daughter, which I really appreciated. She's charming, talented, and fun--I hope we see her in an IndyCar at some point next year. -Perhaps the coolest moment was getting to meet one of the people I admire most, track historian Donald Davidson! I got to talk with him for a minute, and tell him how much I love The Talk of Gasoline Alley. I also joked about how every year, he gets the caller with the Jim Hurtubise Beer Under The Engine Cover Story. Absolutely a priceless moment. -In addition to this, we wandered around the museum and the Louis Chevrolet monument, checked out the gift store and grill (both had some great discounts; the daughter snagged a Sarah Fisher t-shirt), and watched people do the IndyCar simulator and talk about IndyCar and the 500. It's a great day any time you're at the Speedway, but this one was truly special. I hope next year sees another great Fan Appreciation Day, because we truly enjoyed it. Thanks to IMS and IZOD IndyCar for putting this on. I'm already a die-hard fan, but I think this is the sort of event that's great for making a whole new generation of die-hards fans. I think my daughter would agree. Sad news coming out of IndyCar today. From all reports and pretty solid sources, it appears Simona de Silvestro and HVM Racing are at risk to miss the IndyCar season finale at Homestead. Apparently, the team has been locked out of their garage, and security has been posted. HVM is a small-budget team that was hit hard by some unfortunate accidents this year, and is shoestring all the way anyways. If HVM is unable to make it to Homestead, that will destroy the exciting Rookie of the Year battle that was coming down to the last race between Lloyd and de Silvestro. It’s times like this as a fan you wish you could do something, but this won’t be the first or last time a racing team doesn’t make it to the end of the year. It’s a mixed bag today. On one hand, Ana Beatriz will be driving for Dreyer & Reinbold at Homestead. It’d be great if Mike Conway could have made it back in the car for this one, but we’ll see him next season. Now, you have to wonder if we can say the same for Simona. Are You Going To IMS Fan Appreciation Day? This Saturday (September 25th), I’ll be loading up the oldest daughter and heading to the Speedway for IMS Fan Appreciation Day. A few (to be announced) IndyCar drivers will be signing autographs, 11am-2pm, and the Most Knowledgeable Man In The Universe, legendary track historian Donald Davidson will be there from Noon-1pm. Throw in some freebies, a 75% sale at the Gift Shop, some games (including the IndyCar simulator), and I’m there! The event runs from 9am-5pm, and sounds really great. This is really cool of IMS, so please help spread the word—this could be a great chance to help introduce someone to IndyCar. Plus, do you really need an excuse to visit the Indianapolis Motor Speedway? More details here at the IMS website. The race at Motegi wasn't a barn-burner like some others, but it definitely held its share of excitement. Helio Castroneves came away with a dominating victory, Dario Franchitti claimed the first ever AJ Foyt Oval Trophy, and Will Power now leads Franchitti by only 12 points in the overall championship hunt going into October 2nd's finale at Homestead. -The Versus chat was a lot of fun. Thanks to Lindy Thackston, Pressdog, Roy Hobbson, and all the others that made the event so much fun. -I'm not entirely sure Jack Arute knows what the equator is, exactly. Also, apparently, the humidity at Japan was about 546%, because dude was sweating buckets. -Bertrand Baguette didn't make it too far in this one before crashing out. There went my dark horse pick. Baguette is mathematically out of the top rookie running now, but de Silvestro and Lloyd had issues of their own last night. Lloyd still leads de Silvestro by 18 points, and barring something big at Homestead, pretty much has this clinched. -Simona de Silvestro's ride, by the way, had some tough going. It was apparent the HVM Racing crew did a good job just getting it together in time for the race. They had to retire due to some vibration, but those are the hidden stories, sleepless nights, and true struggles that are such a fascinating part of the sport. -Another rookie, Takuma Sato, kept it together in front of a friendly crowd last night, finishing 12th in a respectable performance. I think we all thought he was putting it into the wall a couple of times, but if Taku was going to finish another race this year, this was the one for it to be. Another native son of Japan, Hideki Mutoh, finished 14th with his dad watching for the first time. 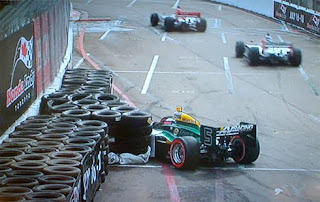 -Mario Moraes' accident was seriously scary. We've seen too many drivers who've backed it in suffer back injuries, and it looked like Moraes would be another unfortunate example. Glad, and a bit surprised to hear he was ok. Yes, another wreck for KV, but that one was all mechanical. -Nice night for Andretti Autosport, whose drivers finished 5th, 7th, 9th, and 11th. For much of the race, it looked like all four Andretti drivers would find a place in the Top 10, and they very nearly did. Danica Patrick's 5th place run was one of her better, more competitive rides this year. -Speaking of the Top 10, good runs for Graham Rahal (8th) and Dan Wheldon (10th). Rahal looked like he was destined for a mid-pack finish for a bit, but did a nice job in the last stints picking it up. Wheldon's 10th place run means 3 Top 10 runs in a row after a horrid 25th place at Sonoma. That's Wheldon on ovals for you, though. -Franchitti has systematically chipped away at Power's once-considerable points lead. We've seen some upsets to end the season before, but I still think going into Homestead, I've got to go with Dario. He won at Homestead last year, and if I still have him available in my fantasy league (I don't), that'd be my pick. -You can debate with all rights the wisdom of having Motegi on the schedule at the date and time it currently inhabits, but it was great to see such a robust, enthusiastic crowd at an IndyCar race. It's cool knowing there's a community of IndyCar fans half a world away. Let's hope some of them can make it for the Centennial Indy 500. We'll finish this season up at Homestead on October 2nd, but for now, this year's Indy Japan 300 is in the books. Will Mike Conway Return At Homestead? Interesting article by Marshall Pruett today on Mike Conway. After a horrific crash at the Indy 500 this year, Mike has been recuperating injuries to his lower left leg and his back. It's been hoped Mike would be back for the finale at Homestead, but it sounds like that's still up in the air, that there may be more rehab to do. Whether it's Homestead this year or needs to be 2011 in St. Pete, it'll be good to have Mike back. He had as many Top 10 finishes in 6 races this year (3) as he had all of 2009. The guy's definitely on the way up, and I have a feeling he'll be seeing a few podiums on the road/street portions next year for sure. When you look below at this accident (which I swear is the last time I'm going to post this; just looking at it makes me break out in a cold swear), you have to marvel at how these guys can get back in there and do it all again. Cheers, Mike, and best of luck as you come back. It doesn't get any prettier the 231st time I view it. Favorite: It has to be Dario Franchitti, followed closely by teammate Scott Dixon. He’s got the Ganassi Big Red Machine backing him up. Best of luck to Power, but it’s an oval, and a new one for him at that. Non-Red Cars To Watch For: Dan Wheldon and Marco Andretti. The 4 and 26 cars have been extremely competitive the last couple races, and I don’t see that changing here. Andretti finished 7th here in ’09; Wheldon was 8th. Dark Horse: Paul Tracy. 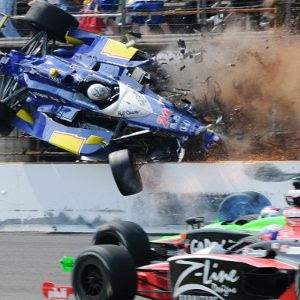 See, his teammate, Justin Wilson, qualified 9th here in 2009, finishing 12th, and…you see…it’s like this….ok, I’ve got nothing to suggest that Paul Tracy will do anything other than bring his ride in between 13th and 16th place. Call it a hunch. A sucky hunch, but a hunch nonetheless. Others: Hideki Mutoh will be fun to watch in front of a native crowd—his last two finishes have been 14th and 11th. Also interesting will be how part-timer Roger Yasukawa and the Conquest Racing Team fares, especially with rapidly-improving rookie Bertrand Baguette (10th at Kentucky). Crash-Crash-Crash: Can KV Racing get through without a major incident? Probably not, but perhaps Takuma Sato will be inspired in front of what should be a friendly crowd. How friendly they will be after he launches his car into the grandstands remains to be seen, but the Japanese are notoriously polite. Ovals Aren’t Easy: Simona de Silvestro will be trying to bounce back from a crash at Kentucky. Her and Alex Lloyd are close in the Rookie of the Year standings, and an awesome finish at either of the last two races could cement things. Simona’s yet to have a finish better than 21st of any oval outside of Indy, so she’s got her work cut out for her. Danica Watch: Danica Patrick’s finishes here have been 4th-8th-11th-1st-6th. If there’s any track she might break out of her funk on, this might be it. Pole Position: Briscoe. He’s due (again). Laps Led: Franchitti. Let’s not kid ourselves. Winner: Franchitti. I don’t see a smart bet against him here. This race should set up a great finale at Homestead! Scott Dixon smiles! Who knew? Now can he repeat? Analysis: Alex competed at Indy last year, but is still an overall series rookie, despite first running in 2008. He’s been a backmarker outside of Indy for much of the year, but also managed Top 10s at Texas and Sonoma. It’s been a pretty uneventful year outside of that and Indy, but then again, Dale Coyne racing isn’t usually rushing to the front. He needs some development on road courses, but everyone knows he’s got a lot of talent on the ovals. If he keeps his nose clean for the last two races (both ovals), he should have the most points of any rookie this year. Analysis: Let’s face it, Simona is going to be the emotional favorite for a lot of people for Rookie of the Year honors. That’s not a crime; she’s likable, handles herself well, and I think people see her for a potential series star. Rookie of the Year honors (and 14th place) at Indy helped, but we’ll have to see if she’s got enough in these last two ovals. Her average finish on ovals so far is 21.3 (versus 16.2 on road/street), so she’ll need to step it up a bit at Motegi and Homestead to pass Lloyd. Analysis: Baguette missed the first two races of the year, which probably killed his chances for Rookie of the Year honors, barring an epic finish to his year. And let’s face it: the Belgian with the funny name was not even expected by many of us to make the Indy 500 field this year. But Baguette has stayed out of trouble for most of the year, and has done far better than expected on ovals. He’s flirted with the Top 10 most weeks in the second part of the year, and has noticably improved as the season wore on. He probably won’t win it, but that shouldn’t take away from a good freshman year. Analysis: It’s been a nightmarish year for Sato, who has crashed out of nearly every race this season. It’s not that’s he’s doesn’t have any speed or skill; he’s shown flashes of being quite fast. A combination of recklessness, inexperience, and yes, a little bad luck, has made this a campaign to forget. If he returns next year, perhaps he can minimize the mistakes and show us something more than he has, but as it is now, we expect him to meet the wall at some point during a race. At least he’s got the coolest car of any rookie--that Lotus Green paint job deserves better. Not Mentioned: Mario Romancini, Ana Beatriz, JR Hildebrand, Jay Howard, and others: too few races to matter. Verdict: Alex Lloyd should take care of business the last two races, and secure Rookie of the Year honors. But neither Baguette or de Silvestro have anything to hang their head about. If only all rookie classes were this promising! Sato's rookie season has been one to forget.